Under California Rules of Court , qualified and experienced attorneys may volunteer their time to serve as part of the Superior Court of California, County of Santa Clara's Temporary Judge Program. Temporary Judges are appointed and serve at the discretion of the Court. The Presiding Judge's letter of invitation to the Bay Area legal community provides information about the Court's Temporary Judge Program. The Court continuously recruits temporary judges. For more information, click to see the Court's Temporary Judge Program Brochure . Has satisfied all other general and specific conditions the Court may establish for appointment. Click the links below to access and submit these web forms. Note: the forms must be completed and submitted ONLINE. Mandatory courses, as well as substantive classes, are offered by the Superior Court in Santa Clara County at various times during the year, as part of the Temporary Judge Program. Local courses may qualify for MCLE credit. Locally provided training materials are available for download, from this web page. The Bench Conduct and Demeanor training class must be taken in person and be taught by a qualified judicial officer. The training class materials used for this course can be accessed here. MCLE credits will be provided to attendees at no cost. Prior to attending the mandatory Bench Conduct and Demeanor class, interested applicants must complete two short exercises entitled Self-Monitor Scale and Implicit Association Test. These exercises can be found in the Bench Conduct for Temporary Judges online course materials on the Judicial Council Education site. These exercises are for self-evaluation - it is not necessary to save or bring results to class. Mandatory Judicial Ethics courses are available on-line: Judicial Council Temporary Judge Resources website . Upon completion of the course, please enter your name and the date, print out the certificate of completion, and email it to the Temporary Judge Administrator at TJP@scscourt.org. Local classroom training may also be available - please check back later. The court intends that, for temporary judges serving in the civil, probate and family divisions, the initial and continuing substantive training may be satisfied by appropriate courses taken to fulfill the State Bar’s MCLE requirements. 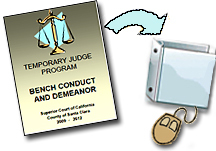 The Judicial Council Temporary Judge Resources website provides mandatory and subject-area (Civil, DV, Ethics, Family, Juvenile, Small Claims, Traffic) substantive online courses, publications, and participatory materials developed by the Education Division/California Center for Judicial Education and Research (CJER), for use by judges, commissioners, and referees. Online courses may qualify for MCLE credit. To verify Judicial Council online course completion and to maintain good standing with the local Temporary Judges Program, please fill out the Certificate of Completion at the end of each course, and email a copy to TJP@scscourt.org. How Does a Laser Speed Gun Work? §4.01 Contractor’s License Law—Who’s a Contractor? Mandatory Civil Settlement Conferences occur only on Wednesdays of each week. Due to this limited schedule, if you are eligible to serve as a Civil Settlement Conference Temporary Judge, you must complete the Civil Settlement Availability Form . Please read the Instructions on how to submit the Civil Settlement Availability Form for assistance. Forms may be updated any time and must be submitted to the Civil Calendar department at TJP@scscourt.org. If you have a complaint about a Court-appointed Temporary Judge, please print the complaint form and send the completed form to Temporary Judge Administrator at the address on the bottom of the form, or email it to TJP@scscourt.org. To contact the Temporary Judge Administrator with questions or for general information, please email TJP@scscourt.org. The following linked documents provide help for Temporary Judges when parking at our courthouses. Also, see the section below on commute alternatives. For Temporary Judges interested in occasional or regular alternatives to driving and parking, please see the following links. Note - the 511.org website provides help with traffic/travel planning as well as extensive information on commute alternatives and benefits.